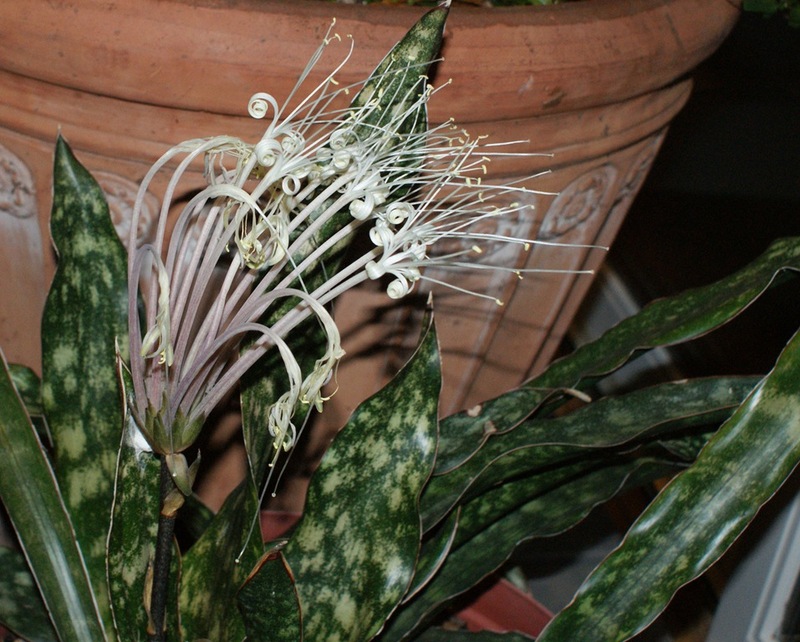 While today’s cold wind and rain are whipping the flowers that remain out in the garden, I thought I’d share pictures of a favorite, and unusual, houseplant of mine that bloomed indoors this week: Sansevieria kirkia var. pulchella. Sorry, it doesn’t have a common name, but as a Sanseveria it is related to the plants commonly known as mother-in-law’s tongue and snake plant. (I have something of a collection of them, but won’t go into detail here, because someone may try to cart me away to the loony bin if I mention another plant collection.) Sansevieria kirkia var. pulchella is native to southeastern tropical Africa. It is as tough and undemanding a houseplant as you can find. It’s really hard to catch the full effect of the flowers in a picture. The individual tubes measure 7 inches from the base to the tip of the pistil. A bit of a search on the internet yielded pictures of other gardener’s plants that are producing much more spectacular flowers than mine did. Still, I’m thrilled. The flowers are composed of many 7-inch-long tubes that are maybe 1/8 inch wide. Watching the tubes open is an experience in and of itself. They split at the tip into lobes that roll up to reveal spidery stamens and a pistil. Alas, each flower only opens for about 24 hours before wilting, but all the flowers in an umbel don’t open on the same day, which helps spread out the show a little bit. As I finish this post, sloppy wet snowflakes are pounding my office windows. It’s nice to have started the winter season with flowers in the house already! Sanseverias are fantastic and easy houseplants and great in containers for the summer – never saw the flower before – Thanks, Barbara! Hi Donna! Yes, they are super easy, and there are tons of ones with fabulous foliage (I’ve managed to restrict my collection to about five plants thus far). The flowers are totally unexpected, though. You wouldn’t think that a tough, no-nonsense plant would have such lovely delicate blooms. Lots of descriptions say many of them have fragrant flowers, but I haven’t noticed that in any of plants I have.